Secondary school maths teachers and heads of department. The Work Group will focus on fractions, establishing what the issues are and what the common misconceptions are, how these might be addressed through activities and questioning which promote deeper thinking and how teaching in KS3 might be modified or utilised to improve understanding for this topic in KS4. Teachers will hone their ability to analyse what it is about certain topics that makes them more challenging and be able to apply these analytical skills more widely in the curriculum. Through detailed study of one topic, teachers will develop a sharper understanding of what it means for teaching to be ‘effective’ and how this might be evaluated in class and through assessment in all its forms. 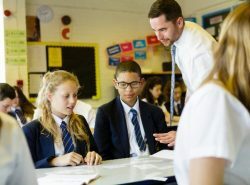 Pupils in the participant teachers’ classes will become more confident in their own skills and abilities, developing a deeper and more connected understanding of prior content thus enabling them to better tackle the challenging topics. Collectively, the network of Maths Hubs across England work on projects around national maths education priority areas. One of those priorities includes the phrase ‘supporting schools and colleges to address the immediate challenge of teaching the 9-1 GCSE.’ Each Maths Hub participating in a national project runs a local Work Group, where teachers come together over a period of time to work on areas defined by the project. All Work Groups are subject to a common evaluation process, which collectively provides a body of evidence on the project’s outcomes. So, your participation in this Work Group will contribute to your own professional leaning, and that of your school colleagues, as well as making a contribution to the improvement of maths education at a national level. This Work Group extends work started in all Maths Hubs in autumn 2016. Attend the Work Group sessions and carry out a series of follow up tasks within their own classrooms related to teaching the challenging topic being explored. Work with other members of their mathematics department, as appropriate to develop the teaching of the challenging topic. The work group is funded by the Maths Hub programme and is offered free-of-charge to delegates.